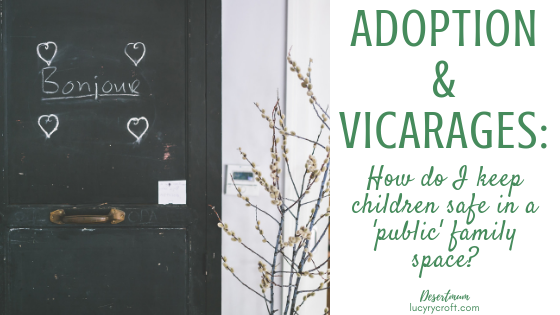 Adoption and Vicarages: How do I keep children safe in a ‘public’ family space? The adoption process involves several home visits. Your social worker doesn’t need to see a show home (thank flippin’ goodness for that) – but they do need to see that you have the space for a new child/ren, that you’re able to keep the home clean and tidy enough to nurture human life, and that there are no obvious safety hazards for a young child. Our situation, as the fortunate inhabitants of a ‘free’ home (my husband is a vicar – the vicarage comes with the job) had its pros and cons when it came to these visits. The pros were plentiful: we have enough bedrooms for an extra child or two (vicarages are supposed to have at least four bedrooms as standard), there is plenty of space to play downstairs, and we have a decent-sized, child-friendly garden. Location is also important, as isolation can be a huge cause of post-adoption depression (as it can be with post-partum depression). On that front we ticked all the boxes too, being within an easy walk of shops, cafes, the library, our church, several toddler groups, a gymnastics centre, a swimming pool – and we live directly opposite the primary school. In many ways, our home and its location were a gift to us (and our social worker) as we moved closer towards our adoption panel. But on the second occasion that our home was ‘inspected’, there was something we couldn’t hide. It was blindingly obvious that someone was living in our spare room. There was more luggage than one might bring for a night or two’s stay, so we couldn’t have fudged it, even if we’d wanted to. The man in question was a friend of ours, a new member of our church, a Dad of similar-aged children to our own, and someone we trusted. He’d had some accommodation problems which had left him temporarily homeless, and we were happy to step in. He must have stayed for two or three weeks at the most – no big deal. If our social worker had visited on either side of that fortnight, she’d have known no different. And, by this point, she’d got to know and trust us, so there was never any question of her stopping us from going any further in the process, but her visit, and her discovery, provoked an important question. It was fair enough – and fortunately we were in a position to be able to answer with confidence, having already thought through this issue with our two birth children. In order to share the answer with you, let me back-track a little and explain the concept of a vicarage. It’s a home owned usually by the Diocese, sometimes the church, which you and your family can live in rent-free for the duration of the time you’re working for a particular church. 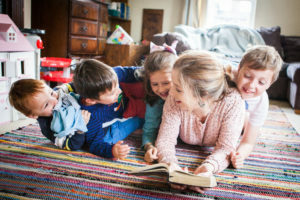 Vicars might be single, or they may have large families – but the vicarage needs to be suitable for all – hence the four-bedroom rule (although some have five or six). They also tend to have gardens and be in a convenient location for the church/es for which the vicar is working. Another aspect is that they are supposed to have two reception rooms – specifically so that the family has somewhere to go when meetings are being held – and also a study, which is supposed to be accessible without guests having to go through the house. In other words, there is the expectation that the vicarage will be used for church meetings and business, but also that any family members should have some privacy and protection from those coming into the house. Now there isn’t specifically an expectation that there will be a spare room dedicated to anyone who’s in need of urgent accommodation – but it kind of makes sense that, if you’re a Christian and someone is in need and you have the space, you will accommodate them. I’d hope this would be true of any Christian with a spare room, not just those living in a church-owned house. The thing that makes all this more complicated is that, inevitably, a vicar’s work will bring him/her into contact with vulnerable people, some of them very damaged. So, when your home is also a work-space, and when that work involves vulnerable adults, it’s important to put up some boundaries to protect your family, not least if you have adopted or foster children who are particularly susceptible. Here is a longer version of what we told our social worker. Yes, we’ve had alcoholics, recent prison graduates, thieves and drug users in our home for meals or to watch a sports match. But they’ve all been people with whom my husband has built a relationship through a church ministry. Often I get to know them too, and they become friends. Our boundary is that we wouldn’t invite cold-callers into our own home – if someone unknown to us were to ring our doorbell and ask for a meal or some accommodation, we would support them in getting what they needed, but we wouldn’t physically bring them into our home. And it should go without saying that we would never tolerate drug use, or excessive drinking, in our home. Fortunately, those invited in have always honoured our family in this respect. We love to host meals for others, especially Sunday lunch, which we’ve found can be a great ‘levelling’ meal for lots of different people to come together. But this is a specific invitation for a specific time of the week. And while we have an open home to those we know well, we are careful to invite more vulnerable/less well-known people at specific, appropriate times. The boundary here is that if I’m home alone without my husband and someone comes to the door, I’ll have a conversation on the doorstep but won’t invite them in. And we’ve never initiated the kind of culture where people can just show up (although we absolutely have this culture with those we know well). A meal is one thing – an overnight stay is totally different. There are numerous safeguarding issues involved when someone, say, with a criminal record is in your home with your kids while you’re asleep, not to mention the awkwardness of having to shoo them out the next morning. The friend in question who was staying temporarily with us when our social worker visited was already a trusted friend, someone we saw regularly and had got to know reasonably well. He wasn’t a risk to our children, he was not addicted to drugs or alcohol, and he has no criminal record. Our boundary here is that we err on the side of caution. Those who stay are either pre-planned friends and family, or local friends who suddenly find themselves in need of a bed – I think there have been around four of these over the last four years in this job, so not a huge amount. This sounds obvious, but we make sure we’re always with our children – that they never have any 1:1 opportunities with those who visit. We don’t nip out and leave others in charge of them. The only people to babysit are trusted friends and family. As much as anything else, this protects the adult in question. If we have a vulnerable adult staying with us, we need to protect them too – and having the responsibility of looking after your host’s kids is not a burden they need. Whilst sacrificial hospitality should be a hallmark of all Christian homes, not just vicarages, the sacrifices we make should not involve our children. After all, giving a loving, stable home to children who otherwise wouldn’t have one is a radical and sacrificial act of hospitality in itself. If God has called you to care for vulnerable children, they are your first priority and nothing you do with your home should endanger them. Instead, our homes should be places of refuge and safety, peace and joy. But, as God directs, you will find ways of sharing these things appropriately and safely with those outside of your family too. Like this? Find plenty more adoption articles on my Pinterest board.